Emotions flowed at Taraba State Police Command in Jalingo, the state capital, penultimate Tuesday, during the parade of three suspected ritualists who allegedly killed a six-year-old girl, Maimuna Yahaya. The love of money at all cost and crave for material wealth were two of the reasons adduced for their alleged involvement in the dastardly act. Umaimatu Tanimu and her brother, Adamu Mohammed, in their alleged quest to become rich overnight, were said to have sought assistance from the third suspect, Abdullahi Abubakar, described as a herbalist, for an easy way out of penury. Abubakar allegedly told Umaimatu and Adamu that they would need human kidney for the ritual that could transform them to millionaires. Subsequently, a disagreement ensued between the two siblings over whether to give in to the ritual requirement of the alleged herbalist, but Umaimatu, as claimed, was able to convince her brother by promising to provide the sacrificial lamb. Vanguard reports that Umaimatu, 36, and a mother of three, lured six-year-old Maimuna from Sabongida-Takai village in Gassol local government area of the state into a bush on the outskirts of the community. She later put a call through to her brother, Adamu, who joined her to slaughter the infant, removed her kidneys and abandoned her remains in the bush before proceeding to the suspected herbalist. It was gathered that the duo, after discovering that their dastardly act was in the open, fled the village, but were later arrested by detectives from Taraba State Police Command and confessed to have killed the infant. Spokesman for the police in the state, ASP David Misal, who paraded the three suspects at the headquarters of the command in Jalingo, disclosed that the incident happened on Sunday, September, 2 around 8pm. According to him, the first suspect, Umimatu, held the infant while her brother, Adamu, slaughtered Maimuna before opening up her stomach to remove the kidneys which were later taken to the third suspect, Abubakar. Adamu, while narrating the incident, confessed to have slaughtered the girl for money ritual. According to him, his sister, Umaimatu, talked him into it after he initially disagreed with the herbalist’s demand for human kidneys. His words: “The man told my sister and l to make available human kidneys for money ritual. At first I disagreed but when my sister gave in to the demand, I also agreed. “My sister was the one who provided the small girl we killed and extracted the kidneys from. She lured the small girl into the bush before calling me to meet her up so we could hasten the process. On her part, Umaimatu stated that she had been collecting traditional medicine from Abubakar before he asked them to bring human kidneys for money ritual. 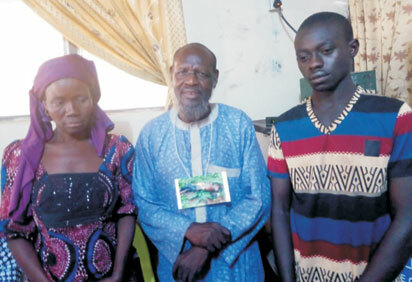 She confessed to have lured the six-year-old into the bush, with the promise that he (Abubakar) would prepare a charm that will help her make more sales in her undisclosed business. The suspect regretted her actions and attributed what happened to greed. Abubakar, although a suspected herbalist, said he had not done money ritual before. The old man, who was sobbing while answering questions from journalists, said he was ashamed of himself. The suspects, who were being investigated for criminal conspiracy and culpable homicide, according to the police spokesman, Misal would be charged to court.